Flash Survey: How Many Hot Dogs Could You Eat? On the Fourth of July, we're obviously thinking about ... hot dogs. The Guardian has weighed in with a long read, posing the question of whether a hot dog is a sandwich. We're all cooking them on grills today. And, of course, there is the Nathan's Famous Fourth of July Hot Dog Eating Contest at Coney Island, which took place today. Miki Sudo, a 28-year-old from Las Vegas, wolfed down 34 franks and buns in 10 minutes to win the women's division. Joey Chestnut won the men's division by eating 61 hot dogs and buns. 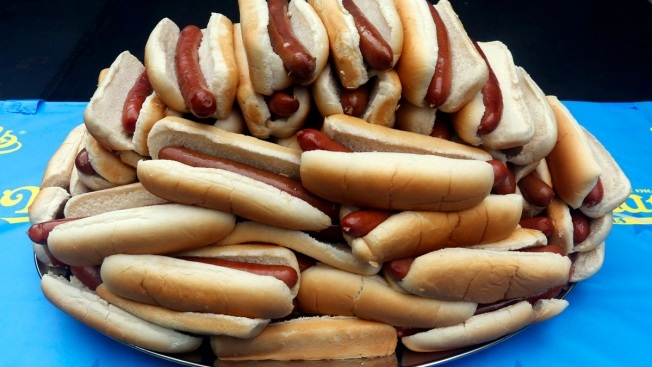 Now, we want to know: How many hot dogs could you eat? That's the question we're asking today, in a News4/NBCWashington Flash Survey. And we want you to join in the voting. On Twitter - tweet to @nbcwashington one of these choices: "None", "1-3", "4-10", or "More than 10"
Here's the results we've gotten for this survey and our other recent surveys.